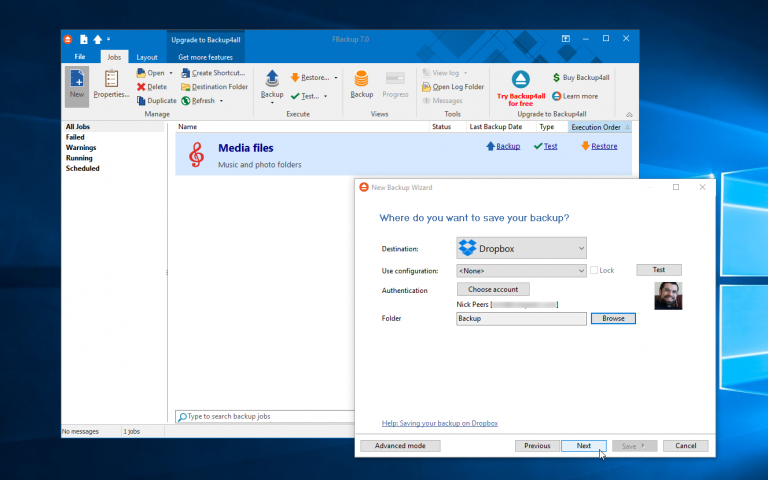 Softland has released FBackup 7.0 and Backup4all 7.0, major new versions of its free and paid-for Windows backup products. Both programs, which offer file-based backup and extended functionality via plug-ins, add new cloud backup destinations, while FBackup gains support for CD/DVD backups and a Fast Mirror backup option. FBackup 7.0’s highlights include two new backup destinations. Users can now back up to Dropbox as well as Google Drive, plus CD/DVD is now an option too. Backups to Google Drive now come with a real-time progress indicator. Elsewhere there’s a new Fast Mirror back-up option that only copies new and modified files. Other added options allow users to specify copying NTFS file permissions when performing mirror backups, "Copy files in a subfolder" and new exclude filters for Office temporary files. mapped Linux drives and Windows system files. The Plugin Management section adds a new search option. Other changes include a redesigned user interface, with the ability to compact and customize the Navigation pane. The New Backup Wizard has been restructured as has the options list. The Last Modified folder date is now also restored from backups. Also updated is the commercial version: Backup4all 7.0 adds multiple Amazon S3-compatible cloud destinations alongside Hidrive and Hubic. Users gain more advanced options: block backup for files over a certain size only, plus a scheduled suspend option for pausing backups between specified times. A quick email notification setting has been added to the New Backup Wizard along with a new Control tab for quickly suspending, stopping or cancelling jobs. Among other changes, the Plugin Creator has been redesigned to make it easier to create user plugins, while all cloud destinations are updated to support and use the latest APIs. FBackup 7.0 is available now as a freeware download (for personal and commercial use), while 4Backup4all 7.0 is available as a trial download with Lite ($19.99), Standard ($39.99), Professional ($49.99) and Portable ($59.99) all available. Both require Windows XP or later.